The magician shows a cup and a ball. A game is played where the magician places the ball in the cup, shakes it around, places the ball in his pocket and the cup upside down on the table and asks the spectator, “ where is the ball? Is it in my pocket or under the cup?” The spectator will respond, “It is in the pocket ”. And of course, since the game is being played with a magician the ball is not in the pocket but under the cup. This game continues back and forth with the ball never being where the spectator expects it to be. Now the magician stops and lets the spectator put the ball in the cup and trying to do the same thing by putting the ball in his pocket, but the ball will not jump back under the cup. But when the Magician takes the cup the game is on again, until finally, 2 large balls or fruits are produced from under the cup. This effect is a lot of fun for both the magician and the spectators and I am sure it will be one of your favorite tricks. 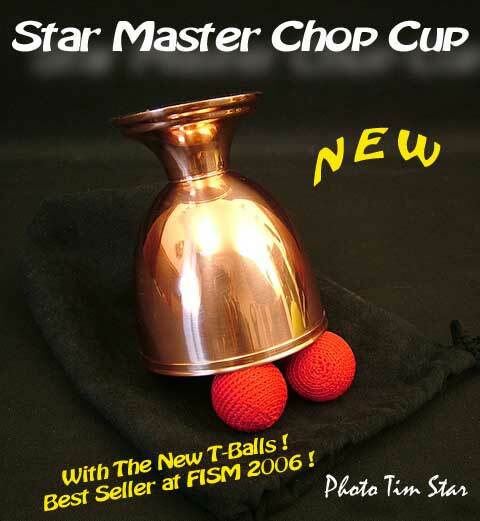 This is the new Star Master Chop Cup first introduced at the FISM convention 2006. It is very diffent than other chop cups. I actualy made this system in my own cup about 25 years ago, but never made any cups for sale. 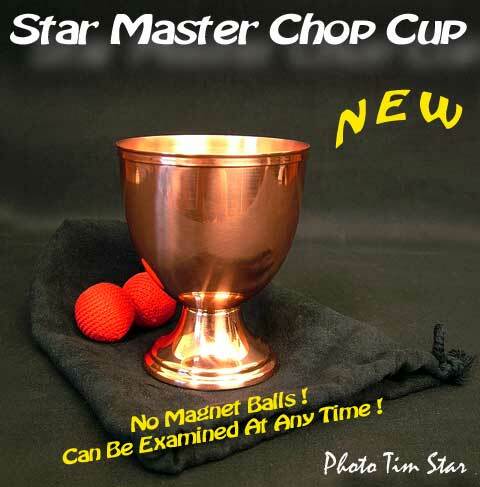 What is the Star Master Chop Cup System? A special gimmic is built in to the cup, and used together with our new T Balls, which is a ball that has no magnet and both balls you will get are the same so there is no need for switcing of the balls. This means the cup and the ball can be examined at any time during the routine. You can stop in the middle of the routine to let the spectator handle the cup, and of course then it will not work as a chop cup, but as soon as you get the cup back you can continue your Chop Cup routine. It is a Chop Cup When YOU want it to be. Due to the design of the cup in combination with the T Ball there is no longer any for banging of the cup on the table, all you need to do is move the cup. T Balls. carrying bag and instructions which will show my way of loading the cup in the mittle of the table. This Beautiful cup is hand spun in solid copper by Tim Star. The cup is polished to a high gloss finish and then clear coated. The cup is 95mm (3 3/4”) high and has a 76mm (3") wide mouth opening.